In the life of a professional athlete, change can happen fast. 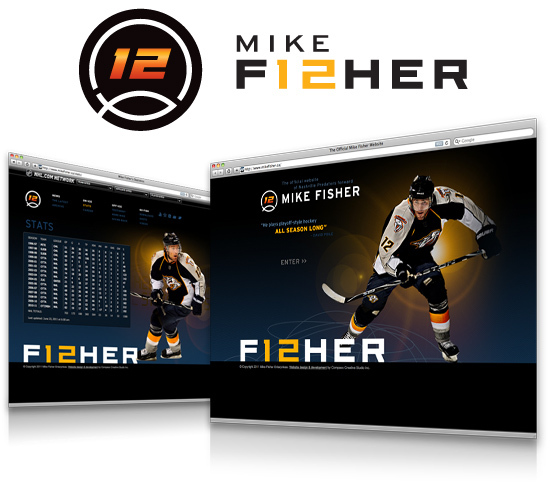 Compass Creative client and NHL hockey player Mike Fisher saw that first hand this past year. Last summer, Mike married country music recording artist Carrie Underwood and began married life by splitting time between homes in Nashville and Ottawa. This past March, however, his professional and personal life became more geographically aligned by a trade between the Ottawa Senators and the Nashville Predators. With a new team comes a new uniform, new colours and new fans. Although the Mike Fisher brand is a personal one, there’s no denying that interest in it is generated by his fans. In this case, the brand strategy is to complement and enhance, not overpower, the team brand Mike is associated with. So with the move to Nashville, changes to Mike’s own graphic identity and website were needed to maintain continuity. Both the icon and wordmark in Mike’s graphic identity were designed with colour versatility in mind. The site background and text also adapted well to the new blue and orange colour scheme. It’s the same strong, determined, get-r-done feel that reflects Mike the person, but now the colours reflect Mike the Nashville forward. Mike’s new Twitter account has been hugely popular, so we gave it more attention and prominence on the updated site – to help keep Mike and his fans communicating about the causes he cares about. Finally, new photography and downloads were added to keep the demand satisfied for current images of Mike in action. The new colours look good on Mike and we’re excited for him and his new fan base in Nashville.